Na Morada Das Parras is a family -run restaurant housed in an old, rustic building of considerable charm and character where a warm,friendly welcome is guaranteed. It's situated in a hillside and rural location which is easily accessible from Nigrán and has commanding views of the sea and mountains. The main dinnng room is cozy,well decorated and full of charm with an enormous decorative gable window with contemporary tables and cutlery. 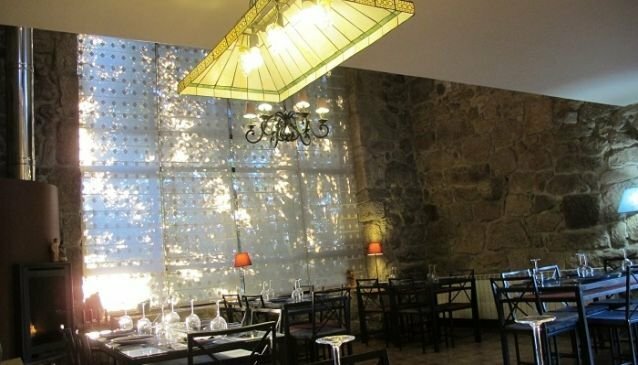 The food is galician with a contemporary twist and varied ranging from a large choice of salads,omelletes,kebabs, cheeses and cured meats,tortillas,fish and steaks and a huge selection of tapas. There is also a great selection of wines and branded drinks and spirits as well as a wide choice of delicious desserts. The restaurant also has a large terrace which is a perfect place to eat and enjoy the views.